James Belben was born on 18 May 1815 at Frampton, Dorset, between Yeovil and Dorchester, and was baptised there on 28 May 1815. He was the son of servant Nathan Belben and his wife Anne. Nothing is known of James' early life but at Melcome Regis, Dorset, on 13 March 1835, at the age of 19, he married 27-year old Emma Hurcumbe. Emma (1808-1862) was the daughter of John and Anne Hurcom of Tidenham, Gloucestershire, where she had been baptised on 12 June 1808. James and Emma were to have seven children; Robert Henry (1836-1902), Maria Ann (1839-1853), Mary (b1840), Emma (b1841), Elizabeth (b 1843), Sabina (b1845) and James George (1850-1857). Robert was born at Sydling St Nicholas, close to Frampton, Dorset, but all the other children were born in Yeovil, showing that James and Emma moved to Yeovil before 1839. In the 1841 census James and Emma, together with Robert, Maria and three-month old Mary, were living in the infamous George Court between High Street and South Street. James gave his occupation as a Police Constable. By 1850 James had moved his family, now including Elizabeth, Sabina and James, to premises in Middle Street where Hunt & Co's Directory of 1850 listed him as a Toy Dealer. In the census of 1851 James now gave his occupation as a 'Toy Shop Keeper'. Daughter Maria died in 1853 aged 13 and son James died in 1857 aged 6. The shop (the building still survives) was in the Triangle, on the corner between Middle Street and Vicarage Street. During the 1850s James attempted more than once (certainly in 1856, 1859 and 1863) to get elected as a Borough Councillor without, apparently, any success. In the late 1850s James was lessee of the Yeovil turnpike tolls - he paid for the privilege and, presumably, hired the toll-gate keepers but kept the substantial net profits. In April 1859 the Western Flying Press reported "It appears that during certain months in the winter, the lessee is authorised to demand an extra toll on 'timber' passing through the gates; and where large pieces have been conveyed, the amount has been paid accordingly." By the time of the 1861 census only daughters Emma and Elizabeth, by now aged 20 and 18 respectively, were living at home with their parents above the Middle Street shop premises. Both the girls gave their occupations as Assistants to their father who listed his occupation as a 'Rag Merchant etc'. During the 1850s James and his son Robert, who moved to Sherborne, had been in partnership as 'chinamen' but the partnership was dissolved in November 1862. On 2 May 1862 James' wife Emma died at home after a short illness. She was aged 53. In November 1865 James was one of several Yeovil men sworn in as Special Constables for the Borough for the ensuing year. In the Post Office Directory of 1866 James was listed twice; as a Fish Dealer of Middle Street and also as a Marine Store Dealer of Middle Street. A Marine Store Dealer was, in fact, nothing to do with boats or the sea but was simply a general dealer at the lower end of the market, dealing with the very poorest people with items usually worth a farthing or a halfpenny. A Marine Store Dealer was considered a very lowly trade and was described by social researcher Henry Mayhew in his book 'London Labour and the London Poor ' (1851) as "merely being one step above those who deal in fats and greases". In the autumn of 1867 James' daughter Sabina married William Dyke at Yeovil and it is probable that William worked with James. On Friday 21 January 1870 the Western Gazette reported "We regret to announce the somewhat sudden death of Mr James Belben, of Middle Street, which occurred yesterday (Thursday) afternoon. The deceased had been ill less than a week, and was sufficiently well on Wednesday to sit up and transact business. He suffered a relapse, however, which, as we have said, terminated fatally yesterday. The cause of death was erypsipelas (a skin infection also known as St Anthony's Fire). Mr Belben will be much missed by the Wesleyans of this district, among whom he was an active and zealous worker." He was aged 55. Following his death, his son-in-law William Dyke took over the business although by 1898 James' son Robert was running the business as RH Belben & Son, noted in Whitby's Yeovil Almanack Advertiser of that year. By the time of Whitby's edition of 1903 the business was listed as Belben Brothers, Furniture Dealers of Middle Street. The brothers were Robert's sons and James' grandsons. Belben's was taken over in 1938 by Deayton's or Parkstone, Dorset and moved to Vincent Street. An extract from the Register of Baptisms of Frampton, Dorset, showing the dates of James' birth and baptism, as well as his parents' names and Frampton as his place of birth. This photograph dates to about 1915 and looks north along George Court towards High Street with the meat market at left and slum housing at right. At the end the 'flying freehold' is built over the tiny entrance to George Court. James and Emma lived in one of the houses at right during the 1840s, where at least their daughters Maria and Mary were born. An advertisement placed in the 5 July 1859 edition of the Western Flying Post describing the vast array of goods that James offered for sale. This photograph dates to around 1900 and looks west along Middle Street. 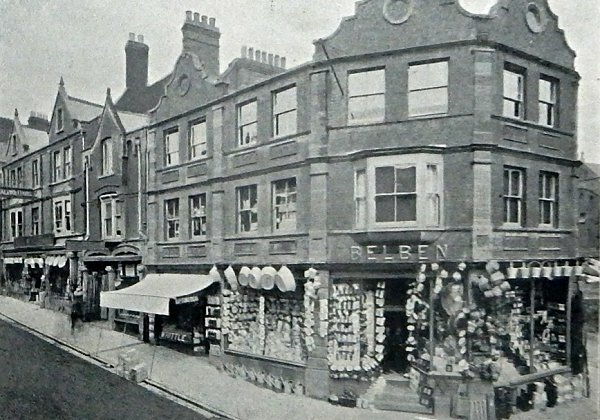 Belben's emporium, seen here on the right, was located on the corner of Middle Street and Vicarage Street as they met at the Triangle. 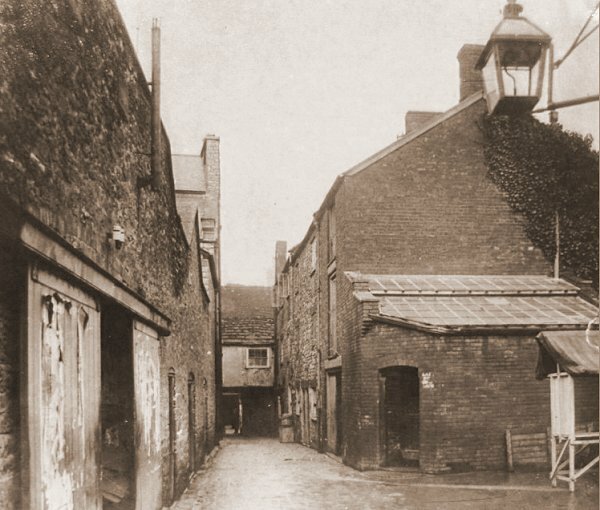 This is the earliest photograph I know showing the Triangle, with Belben's shop at centre. 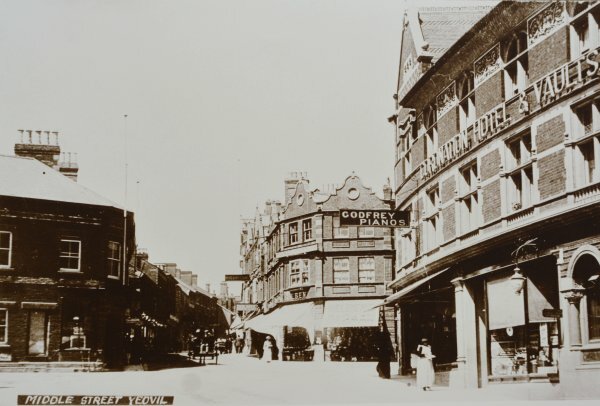 It was taken between about 1900 (when the Coronation Hotel at right was built) and 1910 when the building at far left was replaced by the Co-operative Society building. 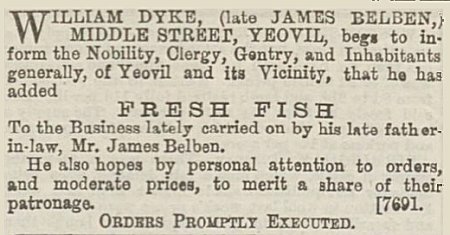 William Dyke's advertisement in the 29 April 1870 edition of the Western Gazette noting that he had added fresh fish to the business. In fact James had dealt in fresh fish during the mid-1860s. 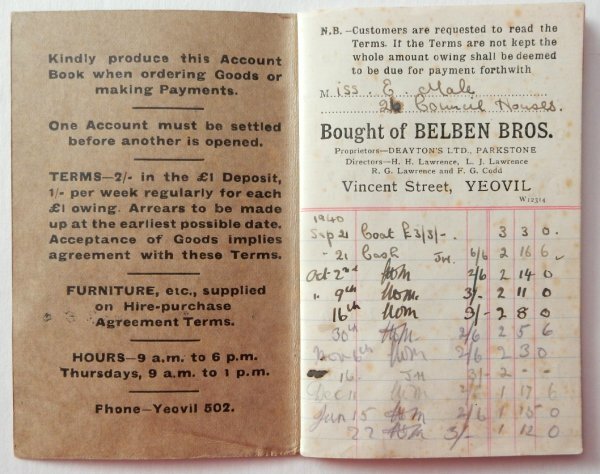 A weekly payment account book (paying on 'tick' or the 'never, never') of Belben Brothers dating to 1940. 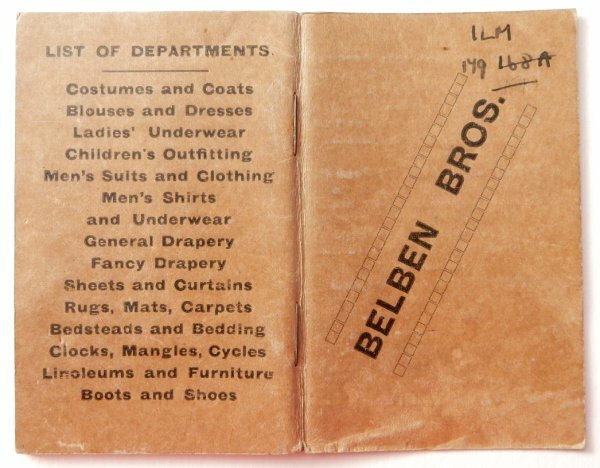 By this time Belben's was owned by Deayton's of Parkstone. On the back of Belben's 6½d Bazaar on the corner of Middle Street and Vicarage Street at the Triangle. This sign is painted on the wall facing the entrance to the Quedam, on the left as you enter Vicarage Street opposite the Methodist church. Photographed in 2013.